First Mining Finance Corp. (“First Mining” or the “Company”) (TSX VENTURE:FF)(OTCQX:FFMGF)(FRANKFURT:FMG) is pleased to announce the release of an initial Resource estimate for its Goldlund Gold Project (“Goldlund” or the “Project”) located near the town of Sioux Lookout in northwestern Ontario. The Company assumed control of the Goldlund project through its amalgamation with Tamaka Gold Corporation (“Tamaka”) on June 17, 2016. The Resource estimate was prepared by WSP Canada Inc. (“WSP”) of Sudbury, Ontario and has an effective date of September 20, 2016. A technical report for this initial Resource estimate for Goldlund, prepared in accordance with National Instrument 43-101 Standards of Disclosure for Mineral Projects (“NI 43-101”), will be filed by the Company on SEDAR within 45 days of the date of this news release. The Goldlund deposit is situated within a land package of approximately 280 square kilometres (28,000 hectares) referred to as the Goldlund Gold Project (the “Property”). The Property has a strike-length of over 50 kilometres in the Wabigoon Subprovince. 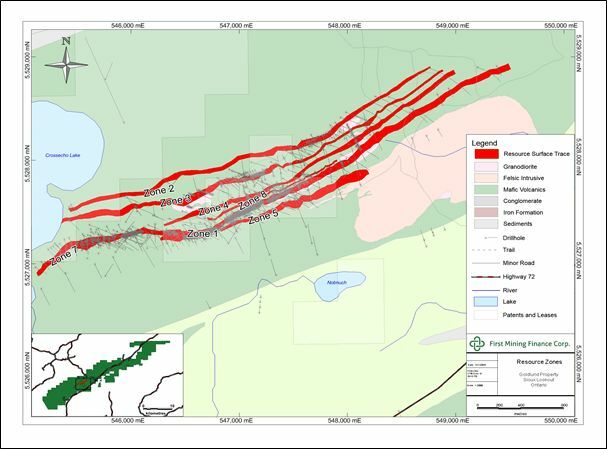 Goldlund is an Archean lode-gold project located in northwestern Ontario, approximately 60 kilometres from the township of Dryden. The claims that make up the land package cover the historic Goldlund and Windward mines, which are currently owned by First Mining through its wholly-owned subsidiary, Tamaka. The Goldlund deposit is currently defined by surface and underground diamond drilling, together with underground development. Dr. Chris Osterman, P.Geo. CEO of First Mining is a qualified person as defined by NI 43-101 and has reviewed and accepts responsibility for the technical information contained within this press release. Mr. Todd McCracken, P.Geo, Manager with WSP Canada Inc., and the author of the Technical Report, is an independent “qualified person” within the meaning of NI 43-101. Neither Todd McCracken of WSP Canada Inc. nor any associates employed in the preparation of the Technical Report (“Consultants”) have any beneficial interest in First Mining. These Consultants are not insiders, associates, or affiliates of First Mining. The results of this Technical Report are not dependent upon any prior agreements concerning the conclusions to be reached, nor are there any undisclosed understandings concerning any future business dealings between First Mining and the Consultants. The Consultants are paid a fee for their work in accordance with normal professional consulting practices. This news release includes certain “forward-looking information” and “forward-looking statements”(collectively “forward-looking statements”) within the meaning of applicable Canadian and United States securities legislation including the United States Private Securities Litigation Reform Act of 1995. All statements, other than statements of historical fact, included herein, without limitation, statements relating the future operating or financial performance of the Company, are forward-looking statements. Forward-looking statements are frequently, but not always, identified by words such as “expects”, “anticipates”, “believes”, “intends”, “estimates”, “potential”, “possible”, and similar expressions, or statements that events, conditions, or results “will”, “may”, “could”, or “should” occur or be achieved. Forward-looking statements in this news release relate to, among other things: commencement of expansion drilling at the Goldlund project; the potential results of such drilling; any upgrade to, or expansion of, the resources on the Goldlund project; and the exploration potential and upside of the Goldlund project. Actual future results may differ materially. There can be no assurance that such statements will prove to be accurate, and actual results and future events could differ materially from those anticipated in such statements. Forward-looking statements reflect the beliefs, opinions and projections on the date the statements are made and are based upon a number of assumptions and estimates that, while considered reasonable by the respective parties, are inherently subject to significant business, economic, competitive, political and social uncertainties and contingencies. Many factors, both known and unknown, could cause actual results, performance or achievements to be materially different from the results, performance or achievements that are or may be expressed or implied by such forward-looking statements and the parties have made assumptions and estimates based on or related to many of these factors. Such factors include, without limitation, management’s discretion to refocus its exploration efforts; fluctuations in the spot and forward price of gold, silver, base metals or certain other commodities; fluctuations in the currency markets (such as the Canadian dollar versus the U.S. dollar); changes in national and local government, legislation, taxation, controls, regulations and political or economic developments; risks and hazards associated with the business of mineral exploration, development and mining (including environmental hazards, industrial accidents, unusual or unexpected formations, pressures, cave-ins and flooding); the presence of laws and regulations that may impose restrictions on mining; employee relations; relationships with and claims by local communities and indigenous populations; availability and increasing costs associated with mining inputs and labour; the speculative nature of mineral exploration and development; and title to properties. Readers should not place undue reliance on the forward-looking statements and information contained in this news release concerning these times. Except as required by law, First Mining does not assume any obligation to update the forward-looking statements of beliefs, opinions, projections, or other factors, should they change, except as required by law.